Here at Care First, we offer the Triangle’s best grooming services. 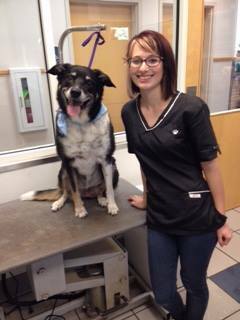 Our Raleigh and Cary groomers will take the time to get to know your pet, making sure that he or she is comfortable and happy throughout the grooming process. As a veterinary clinic, our primary concern is the health and well-being of your furry friend, so you can rest assured that they will be in the most-qualified hands when you choose Care First. Check out our grooming services below, and give us a call if you have any questions! As a service to you, our groomers are delighted to meet you in person to provide a consultation and quote for their professional services. We urge all dog and cat owners to try to keep a consistent grooming schedule. Not only does regular grooming keep your pet looking his or her best, but it also keeps them feeling good, too. Proper grooming, bathing, and nail trimming keeps your pet comfortable and keeps their skin and hair in good, healthy condition. At Care First, we understand the science of pet health backward and forward, so we’ll gladly help you create the ideal grooming plan for your dog or cat. Another important factor when it comes to pet grooming is consistency. We recommend that pet owners introduce grooming as early on and as regularly as possible in order to best familiarize the pet with the process. This familiarity helps reduce fear and nervousness during grooming procedures. Our groomers are especially amazing with new puppies that are getting their first haircut. The groomers’ approach sets the puppy at ease so the puppy can enjoy a positive first experience and a lifetime of pleasant pampering in the years to come. Finally, while we certainly encourage our clients to practice various grooming techniques at home and are happy to help them learn how to do so, we do suggest that pets come into our office for some grooming procedures. Our staff is well-trained and highly experienced in the grooming services we offer, so you can trust that our groomers will provide the most thorough service possible. Schedule Your Grooming Appointment Today! Click here to schedule a grooming appointment for your furry friend at any of our 3 convenient Triangle area locations!